Sports betting is a global phenomenon. Thanks to advances in mobile technology, principally mobile phones, and the pervasiveness of the internet, online sports betting is one of the world’s fastest growing and most dynamic industries. This brings with it incredible opportunities economically including vast employment and income to the state from taxation. However, at the heart of any regulatory system that is adopted has to be the protection of the integrity of sport. Only then will betting operators, sports and other stakeholders, have faith in a crime-free system which benefits all stakeholders. India remains one of the largest unregulated sports betting markets. This lack of transparency has partially contributed to a number of match-fixing and betting integrity issues arising in Indian sport, ranging from cricket and the IPL1 (leading to the high profile ‘Lodha Committee report’2) and Indian football3. However, globally there is a movement by large currently unregulated markets to embrace the inevitable creep of sports betting, meaning the appropriate regulatory approach (e.g. the United States of America4), and integrity frameworks, are now at the top of both the political and sporting agendas. These progressive jurisdictions are in the fortunate position of being able to learn from other countries around the world who have already put in place effective regulatory and integrity frameworks. Leading countries are objectively viewed to be Great Britain (England, Scotland and Wales), France and Australia. Overall, the element of skill must predominate over the element of chance. As a consequence, the test in this regard is called the “predominance test” or “dominant factor test”. The only exception to the current country-wide prohibition is horse racing, betting on which was made permissible following the ruling of the Indian Supreme Court in 1996 in the aforementioned Lakshmanan case, where it was said that betting on a horse race entails evaluating and balancing a number of factors such as the speed of the horse, past performances of the jockey, etc. Regulatory watchdogs would be necessary to ensure that the betting houses as well as those transacting there are strictly monitored, failing which their registrations would be susceptible to cancellation. The Players, Administrators and others closely associated with the sport would be required to furnish the details of their incomes and assets for the sake of transparency. Licenses would have to be issued to those placing the bets as well, with age and identification details recorded. Strict penal sanctions would have to be imposed on those transgressing the license and other requirements. Having written policies and procedures that explain how the business will meet the following licensing objectives: (i) keeping crime and disorder out of gambling (e.g. money laundering, match-fixing); (ii) ensuring that gambling is fair and open; (iii) ensuring that children and vulnerable people are protected from being harmed by gambling; (iv) promoting social responsibility in gambling. Demonstrating with the relevant gambling and software technical standards. An application fee is payable when submitting your application, then subsequent annual fees are due to the GC every year. Gambling has long been totally prohibited in France, but over the years, several exemptions have been granted, gradually authorising certain gambling activities. These must be either offered in specific venues or provided by authorised operators.15 The online gambling authority, the Autorité de Régulation des Jeux en Ligne (ARJEL) can license operators authorising the offer of sports betting. ARJEL has full competence to issue licences, enforce online gambling regulations and fight against illegal gambling websites. Bets can only be made on certain sports, competitions and types of results, determined by ARJEL following consultation with the sport federations. The official list is available on ARJEL's website and ARJEL can decide from time to time to add new competitions or new types of results. Under French law, organisers of sports competitions have rights over the competitions they organise. Consequently, sports betting operators can only offer bets on the competitions for which they have entered into an agreement with the organiser of each competition. Any licensed operator requesting one must be offered the possibility to sign a contract if the operator meets the general conditions set by the organiser. These contracts are reviewed by ARJEL and the French Competition Authority (Autorité de la concurrence) and must offer similar terms to all operators. In July 2016, the Supreme Court asked the Law Commission of India (LCI) to examine whether betting on cricket should be legalised, and, if so, to frame a law be framed to enable it. The LCI published its report "Legal Framework: Gambling and Sports Betting including in Cricket in India" in July of this year21, and addressed topics ranging from the history of betting and gambling in India and the constitution of India and betting, through to the need for regulation. 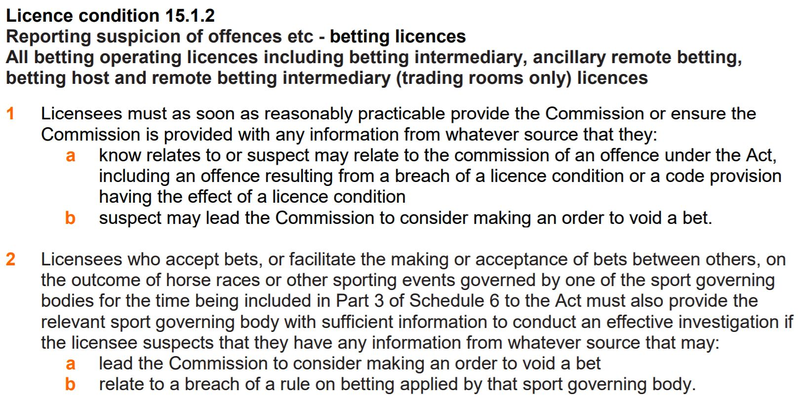 The starting point for the LCI is to consider the reasons why sports betting is currently prohibited in the country, and balance this against the arguments in favour of legalising sports betting. Like most democratic governments around the world, the Indian Government principally prohibits activities such as betting to prevent societal harm (e.g. problem gambling). However, governmental policy may in the present day not be in tune with existing social values, despite morality and religion having a significant influence over gambling policy historically. The LCI recognised the illegal and unregulated betting industry in India, which is extremely difficult to curb/control, is “rampant”. The consequences that ensue as a result include: match-fixing, “black-money” generation and circulation, and associated crimes, and overall the reduction of national revenue/funds which the LCI say could be used for public welfare. Legalisation and regulation would importantly create transparency and ensure the detection of fraud and money laundering. Opining further on spot-fixing and match-fixing, particularly in India’s most popular sport cricket, the LCI believe that if sports betting is left unregulated, this corruption in sport could further manifest and grow uncontrollably. “9.7 The existing policy of the Government (National Sports Development Code of India, 2011, etc. ), the current socio-economic atmosphere in the country and the prevalent social and moral values do not encourage betting and gambling. Accordingly, the Commission reaches the inescapable conclusion that legalising betting and gambling is not desirable in India in the present scenario. Therefore, the State authorities must ensure enforcement of a complete ban on unlawful betting and gambling. The other recommendation from the LCI which is key to the future protection of the integrity of Indian sports was that match-fixing and sports fraud should be specifically made criminal offences, with severe punishments. By learning from the chequered history of betting and Indian sport, and the well-functioning sports betting regulatory systems in other countries (as were also considered by the LCI in their report), these are the elements the author believes India should adopt to maintain the integrity of sports betting, whilst secondary but at the same time, reaping its benefits. Due to the size of the country, and nature of how it is run and gambling regulation is currently devolved, it may be preferable to delegate some of these functions to newly established state regulators. Although there should be stringent licence conditions, both upon application and ongoing, there should no restrictions on the number of sports betting operators that are able to obtain a licence to offer regulated sports betting to Indian consumers. Equally, there should be no restrictions on the betting types which such licensed operators are allowed to offer. This is because India is part of what is now a global online sports betting market. Therefore, if India were to adopt the same approach as Australia (i.e. prohibiting in-play betting), this would simply mean Indian consumers would look to offshore unlicensed bookmakers and the same spot-fixing risks would remain as have arisen previously. The effective, efficient and yet secure exchange of information is paramount to ensure the integrity of any regulated sports betting market. Therefore, it must be a condition of having and maintain a license that all operators promptly inform the national regulator when they become aware of any suspicious activity in the betting markets. Equally, licensed operators must be compelled to operate with the regulator when they request information as part of an investigation. Following on from the obligation to report suspicious information, and the need to exchange information, the national regulator should play a central role in establishing a national sports betting integrity unit. As a minimum, this should be staffed with experts from sport, betting and law enforcement. co-operate with all organisations and relevant authorities at national and international levels, including national platforms of other countries. Currently in India, there is a Sports Integrity Unit (SIU), that was set-up in April 2014 under the Special Crime Branch in India, but its powers are currently limited to conducting investigations and then providing a recommendation to the relevant state.25 However, by widening it’s remit and capabilities in line with the requirements above, the SIU could become India’s “national platform”. Money is the oxygen of match-fixing, and so regulations must be in place to track the money flows from corrupt betting and ultimately recover the criminal assets, to ensure the long-term integrity India sports and the sports betting market. A key factor in ensuring regulation is successful is that the licensed market is protected by preventing unlicensed operators from gaining access. This will require a variety of tactics to be used (e.g. IP blocking), most of which will be driven by technology. All of the preceding building blocks will require new legislation to be passed. However, with protecting the integrity of Indian sport being paramount to any future regulatory approach to sports betting in the jurisdiction, other specific provisions must be included / laws must be passed to create the most robust and comprehensive legislative framework possible. the protection of witnesses and of reporting persons (in accordance with the legal principles of the jurisdiction). The LCI concluded their recent report by quoting Justice D.P. Madon that “as the society changes, the law cannot remain immutable” and that “the law exists to serve the needs of the society which is governed by it.” In the author’s opinion, of all the needs of society, keeping it corruption free is of paramount importance, and therefore the Indian government must change the law to adopt the measures set out in this article at the earliest opportunity to protect the integrity of Indian sports to the fullest extent.